The full range of Universal Plus Guttering System, manufactured by Marshall Tufflex. Ideal for use on larger residential buildings, small commercial premisies and conservatory roof applications, Universal System Plus has been designed to give a highly aesthetic appearance to complement any property. 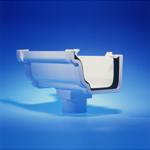 There is a comprehensive range of fittings available and where required special gutter angles can be fabricated to order.